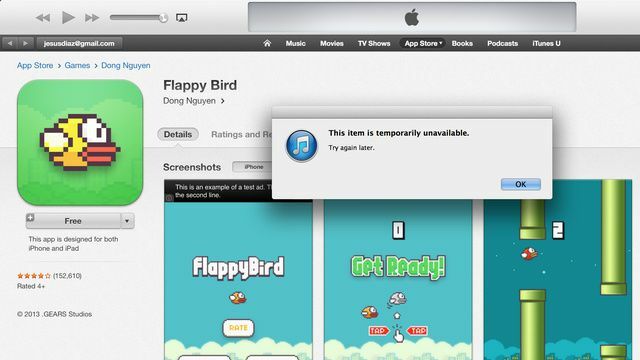 iPhones with the deleted smash hit iOS game Flappy Bird still installed are garnering bids of up to $99,900.00 on eBay. Leading the way is eBay user pindrus who is selling his used 16GB iPhone 5s (“The item may have some signs of cosmetic wear, but is fully operational and functions as intended”) with the game, and has so far attracted more than 70 bids. Other searches show similar sales — as well as sellers unloading their Flappy Bird devices for prices of anywhere from $450 upwards. When we wrote “What’s next for Flappy Bird?” in a post yesterday — first marking the news that developer Dong Nguyen was pulling his wildly popular, $50,000-a-day game Flappy Bird from the App Store — we never expected this. Even taking into account that one or two of these sales are possible hoaxes with fake bids, it seems certain that unless eBay does something about it, a few people are going to make some pretty decent change on this gambit.